Norwich Youth Lacrosse Association is a non-profit youth sports organization dedicated to teaching and growing the game of lacrosse in the Norwich, CT area in a safe and fun environment while emphasizing individual and skill development, sportsmanship, teamwork and respect. Honoring these principles gives youth in our program a positive, character-building experience through the game of lacrosse. This site is dedicated to player, parent, coach and club communications for the Norwich Youth Lacrosse program. Here, you'll be able to get news, information, schedules, rosters, game results, directions and much much more. Check back frequently for the latest information about our organizations. The U10, 12 and 14 teams will all be participating in Montville's Mix of the Sticks Jamboree on April 28th. Details and schedules will be put out soon. In the meantime, custom shirts, sweatshirts, and hoodies are available for pre-order at a discount price by using the following link from Montville Lacrosse and Thirty Sportswear. Pre-ordered shirts will be available for pickup at the event. A limited number of shirts will also be available onsite but not with the discounted price. Parents - please take a moment to familiraize yourself with the rules and regulations we have to follow to maintain our access to the fields at Teacher's Memorial School. Attached a map showing the general location of where each team typically practices and how to access. 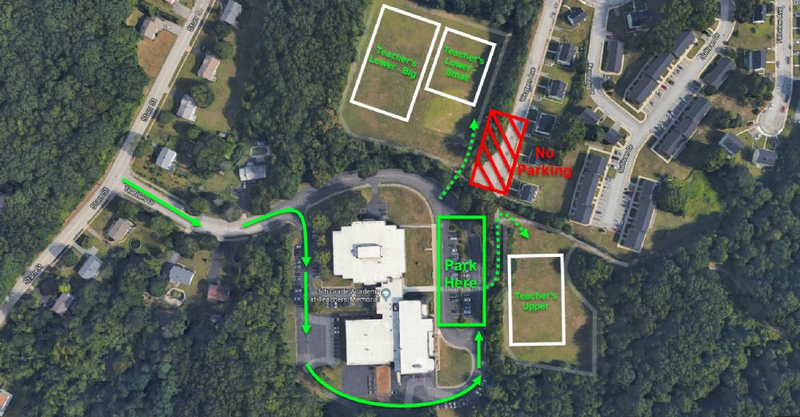 Park in the parking area of the school depicted on the map, there is no parking on Western Ave. This is a residential area. There a few spots for coaches only! We all need to follow the rules of no smoking, alchohol, or pets or we could lose our field permit. These rules apply to any field we may play on throughout the season. Please do not arrive to school before 5:15 so we do not interfere with school activities. There will be a port-a-potty placed within the next few days and as always please remember to leave the field better than you found it. Which is a good introduction to we will be planning a field clean-up day and hope to have many volunteers assist! More info to follow. Registrations for the Spring 2019 season are open at this time. The registration fee is $90 and a US Lacrosse membership ($30) valid for the duration of the season is required. The registration deadline for 2019 is February 22nd. All registrations completed or payments made after this date will incur a $50 late fee. Uniforms for the spring season are a separate cost from the registration fee and are required for all U10, U12, and U14 players. The girl's mandatory uniform includes a pinnie and shorts. The boy's mandatory uniform includes a pinnie, shorts, and shooter shirt. ALL UNIFORM ORDERS ARE DUE BY FEBRUARY 22nd. There will NOT be a second order this season. Uniforms can be ordered from the Uniform Store on our website. Additionally, samples for sizing will be available at all Winter Clinics this year. Please contact our uniform coordinator Miranda Poore at with any questions regarding uniform purchasing and sizing.